Here we are entering September, and it’s time again to start thinking about planting. It’s been a transformative past few months for myself (Rob) and my family, with both blessings and challenges aplenty. Back in May, just a few weeks after I saw some of you at our spring pick-up day, we were poised to plant our garden. It was the May long weekend, and I had hundreds of tomatoes, tomatillos, cabbages, squash, cucumbers sitting on the porch, ready to be planted out. Then we got the nightmare call. Someone very close to us had been in a terrible accident more than a thousand miles away. Our life shifted, right then. My wife was on a plane just a few hours later, and I was flying solo at home with the kids for the next two weeks. Recovery from the injuries sustained in the accident are very slow to heal, and in unpredictable ways. While now, several months later, our life has settled down, it will never be the same. If I hadn’t already been on my way to leaving my day job, I would be now! Watching events unfold in a tragedy so close to you really makes you reflect on what’s important in life. So, before I try to sell you plants (come on, you know I’d get to that soon! ), take a moment and reflect on what’s important to you. What have you always wanted to do that you should just make happen? Is there a relationship in your life that you wish was better? What fruit tree have you always wanted to grow that was popular in the middle ages in Europe and has to be bletted before you eat it? 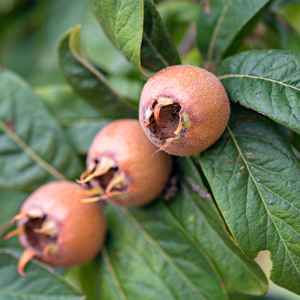 The answer to that last one is Medlar, a fruit that I’ve been lucky enough to taste just a couple of times. Once it’s bletted (ie. over-ripe - when perfectly ripe, it’s too hard to eat, so you let it go soft in storage), it tastes like a spiced apple sauce. Yummy. We had a few extra trees left from the spring, so to save us from planting them out for the winter, why not try one for 30% off? You only need one for pollination, and they don’t get very wide - so a space about 4' or 5’ x 8’ in height would be enough. Very tropical looking foliage. Not much in the way of pests. Impress your medieval historian friends. Note that stock on all sale items is very low - so get them while you can! How about those lovely orange globes that always turn up around Christmas? 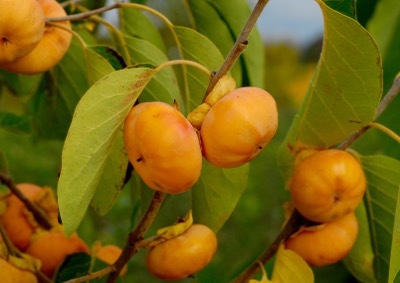 Did you know there is a type of persimmon native to North America? We have two varieties left-over - want to pick a few up? They are self-fertile, with occasional pruning they can be kept to 10-12’. Each fall they have loads of those little orange goodies - so rich and delicious when fully ripe, almost like a mushy, perfect apricot. A couple of years ago we had some extras of this selection of Mountain Ash that has sweet-tart berries that can be used in juices and preserves - full of antioxidants. These have fared very well - they’re getting big! The deer and bunnies never touch them (hint hint, for those with that kind of problem), and even if you are not that interested in the berries for yourself, birds love them. I’ve seen mountain ashes just covered with Cedar Waxwings - they ripen at a great time to help these birds make it through the winter. 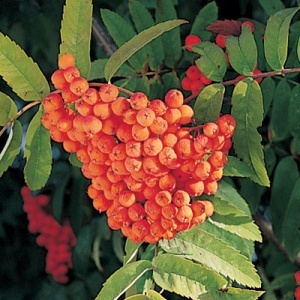 The tree only grows 12-15’ tall, so won’t take up too much space, and while it does produce berries on it’s own, if you have another type of mountain ash around, that would help produce more. Okay, so you can go buy that stuff (by September 24th, for September 30th pick-up just south of Lambeth at the Living Centre), or anything else we have in stock, and I’ll get back to harvesting tomatoes and planting sea kale and blue false indigo seeds. Maybe I’ll see you on our pick-up day on September 30th. There are lots of surprises coming for spring 2018 in our selection of fruit and nut trees, shrubs, vines, and herbs - so stay tuned.